Perennials, Annuals & Veggies: Tips, Tricks & Pix cubit: The best potting medium? Over the years, I have used a variety of potting mixes with varying success. I tried a new item, wondering if it would actually work, and have been very pleased with the results. 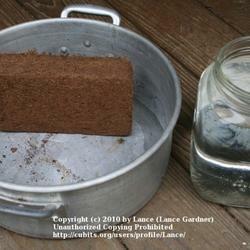 So now I recommend using coir, a coconut based product that uses the leftovers, instead of harvesting peat bogs. Here are the benefits from my experience. Have you ever bought a bag of potting soil, only to open it up and have something that looks wet, goopy, heavy, and unsuitable for a plant that needs to live in a pot its whole life? 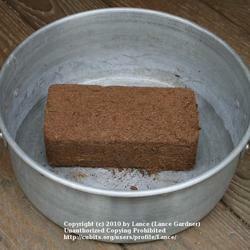 Or perhaps you bought a bag of peat moss that was so dried out you wonder how you will ever get it wet again? Well, don’t throw away that bag! There is another potting medium that you can mix with it. Since I mix most of my own potting soil anyway, I purposely buy those cheap bags on sale at the bargain store just so I can have something to mix in with the rest of my materials. I can tell I have a good mix when I can squeeze the soil in my hand and depending on what type of plant it is, the soil will fall apart easily, stay together a little or maybe a heavier consistency for transplants to go into a garden. 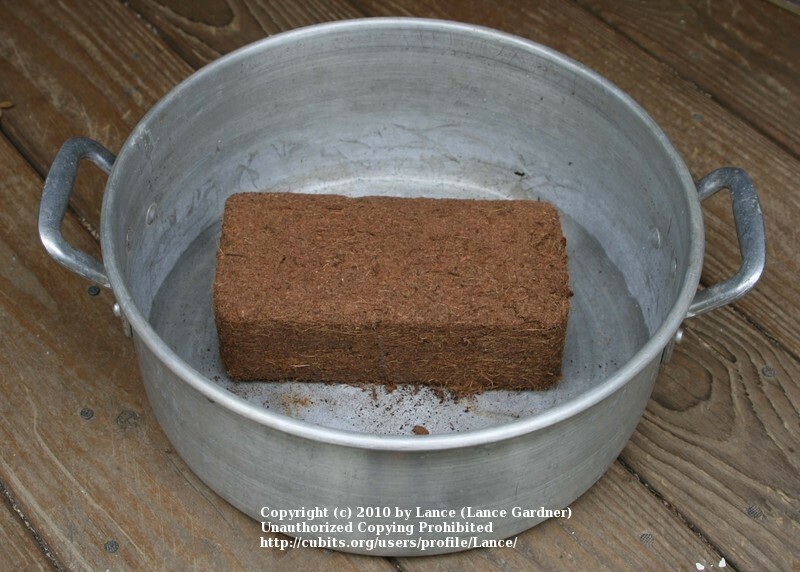 My favorite material to use for potting soil is coir, which is a coconut product and in the past was a waste product from processing the inside of coconuts for eating and other uses. The brown stuff from the outside of the shell had no real economic value to those processing coconuts until its benefits for non-food uses were discovered. The longer fibers are now often used for rugs, liners for hanging baskets, erosion control blankets and ‘logs’, and other similar mostly outdoor uses. This still left the smaller fibers and pieces, again considered a waste product, until its potential for a potting medium was found. A long way from that wonderful tasting coconut is something that can be of benefit to those processing the coconuts and to us, since it no longer needs to be treated as a waste product and we get to reap the benefits of using almost every bit of that coconut. 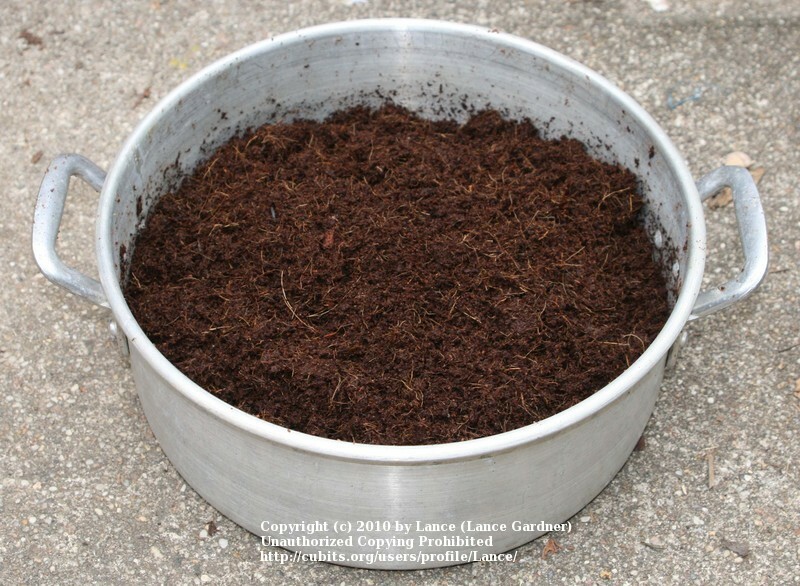 This material has also been found to be a wonderful worm bedding for raising your own worms and producing worm dirt, a highly beneficial soil additive. Less dust than dried out peat bales. 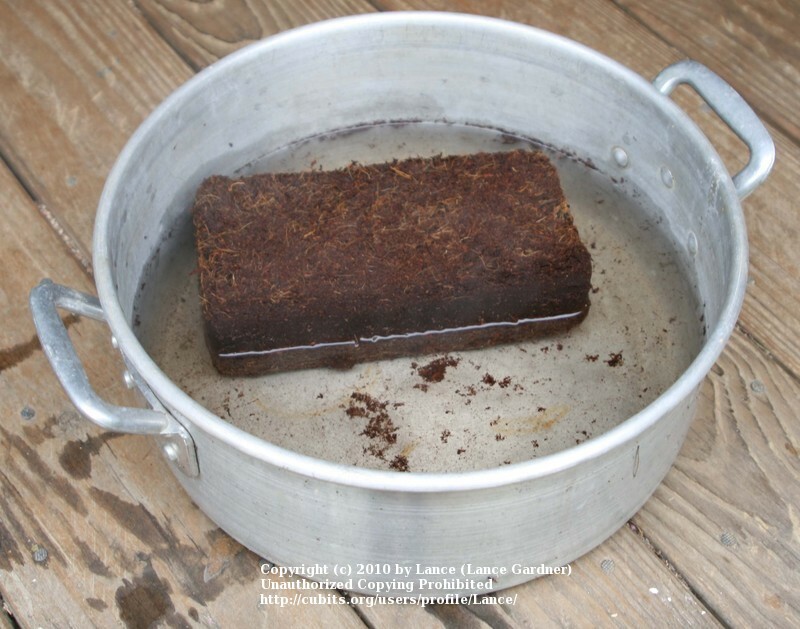 Easier to get wet than peat, as you actually add water to expand the compact blocks, and it absorbs the water like a sponge. Stores more water than peat. Better environmentally, as coconuts grow a lot quicker than peat bogs, and this is essentially a waste product from the other coconut products that has found a viable use. I also don’t care very much for strip mining peat bogs, which leaves nothing for the local ecosystem. Stores smaller, as the blocks are very compressed. Has a variety of uses, including orchids, worm bedding, mulch, rooting and seed starting, and hydroponics. Lasts much longer than peat, which means it will not lose its potting soil attributes as fast. It is also reported to have natural anti-pathogen properties and natural plant growth hormones, but I have not verified this. Like all soilless mediums, it does not have much nutritional value, so you will have to supplement what you use with some type of nutrient enrichment such as compost or kelp. Don’t use too much kelp as I did one year with seedlings, since the salt can kill the plants. This year I used worm dirt with just a little kelp and the seedlings were very healthy. 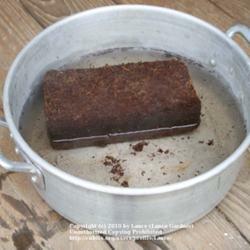 Here is the smaller block showing how much it expands; about one gallon of water was used for this block. 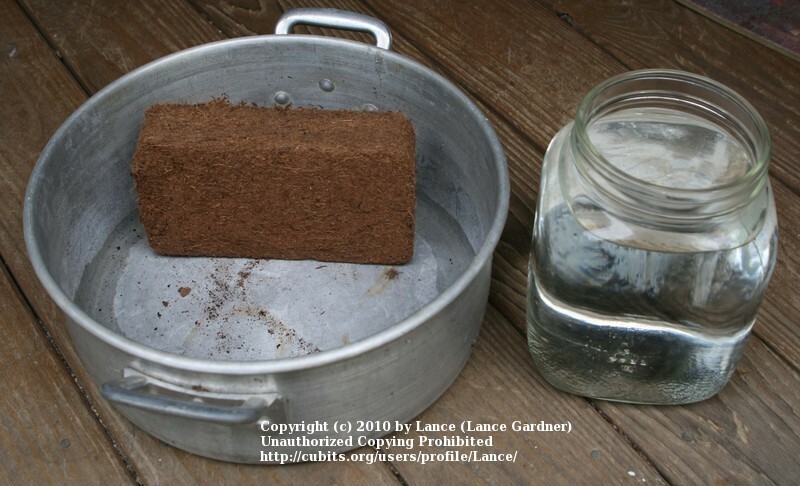 Coir expands approximately 7 times in water, with this block giving about 0.3 ft3 of coir for potting and soil amendment mix. All potting mediums have potential for fungus gnats, and this one is no exception to that. To make the block expand faster and to kill gnat eggs, I use boiling water (boiled eggs, anyone? Maybe a bit small, though!) to rehydrate the block. The block I used here is about 5 years old, and has stored just fine in my outdoor shed. I don’t recommend storing the blocks out in the elements, as rain or other water will probably leave you with a large pile of coir. Although it could be a fun experiment, leaving a pallet load out one rainy night, and see what you wake up to! 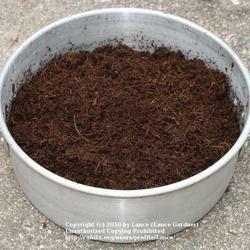 Many commercial potting mixes also use coir, such as Southern States Tobacco and Vegetable Starting Mix. This mix is actually my current favorite for seed starting, and then I mix my own medium to transplant the seedlings into before going into the garden. If you want more details you can easily do a Google search, and Wikipedia also has a very good description of where it comes from and how it is obtained. The link above (http://www.soilteck.com/) seems to have a lot of information, as well, but since they are a producer they better be good at promoting their own product. Sometimes, the coir is rinsed in salt water prior to being compressed, so you may need to be careful and check its origins before buying from a specific supplier. However, I have had no problems with this. Houseplant soil always needs periodic rinsing, anyway. Here is one tidbit to share from Wikipedia: “In a study performed in the mid-1990s at Iowa State University, researchers found that a mix of 80% coir and 20% perlite provided the greatest heights and shoot fresh-weights of petunia and marigold.” Give it a try, and let us know how it goes. And if you already use coir, share your experiences so we can know how you use it, as well.